Letter From Charles Koehn To the First Bank of Randsburg. It explains some cash flow problems he was having with the Kern Valley Bank and asks the Randsburg Bank to hold his thirty-five dollar check for a few days and he would send money to cover it. Ed Starkey of Mojave has been credited by Marcia Wynn Rittenhouse in her book Desert Bonanza, as having opened the first saloon in Randsburg. The records of the early liquor licenses are not considered to be complete, but do list Starkey and Richards among the earliest saloonmen having been licensed in June of 1896. In addition among the earliest saloonmen were Chris Matson who was licensed in May of 1896; Davis & Wolfskill, July 1896; and Charlie Koehn, July 1896.11 This accounts for four of the five that were reported to be in business by August 1896. 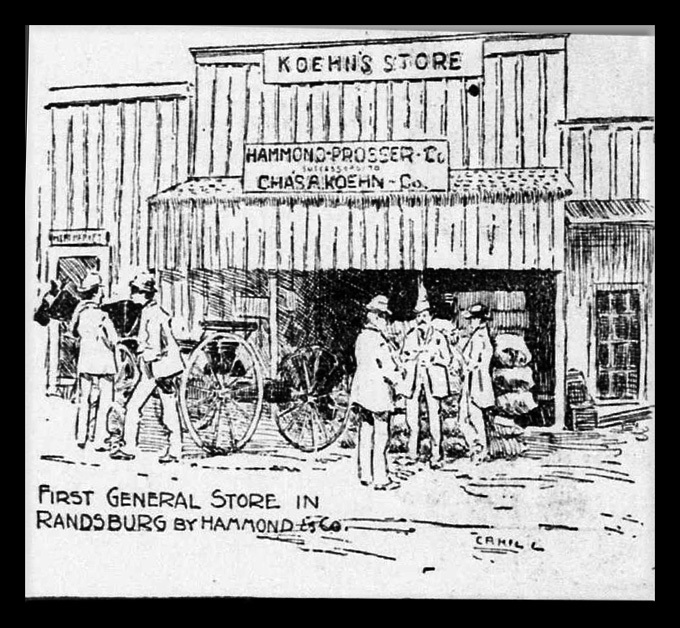 Charlie Koehn's Store on Rand St. His first store was in Pioneer Camp. In January of 1896 the Bakersfield Daily Californian, reported the following: "There have been about 150 locations made in the district, and at a meeting to elect a recorder, there were thirty five miners present. The district is called the Rand District. There are five wooden buildings including stables, corral, saloon and about thirty tents. Water is hauled by Harley Swartout at $2 per barrel and provisions are supplied from the store of the indefatigable desert merchant and hotel proprietor of Kane Springs, Charles Koehn.” This, the first store in town, was most likely conducted from a tent. Later Mr. Koehn built a substantial wood building. In the Rand Mine account ledger on page 3 (page 1& 2 are missing) a listing is found for July 27, 1896 showing a payment to C. A. Koehn for $2.40. In December of 1896 Harmon Prosser is listed as the successor to Mr. Koehn. In July of 1897 however, the Register of Licenses for Kern County, showed that Mr. Koehn was still selling liquor in Randsburg as well as Cow Wells (Garlock). came to town yesterday from Kern County, where he is part owner of several promising mines that have very recently attracted considerable notice. But that is not why Mr. Stanton smiles. He has struck a great flow of artesian water on the Mojave Desert. It was all the more pleasing to him because he was not expecting anything of the kind. Now he wonders if his connection with the hotel resulted in his becoming the unconscious possessor of the charm that in days gave the great breach-of-promise man his title of Lucky Baldwin. “The well,” said Mr. Stanton, as he stood before the Baldwin bar and sipped leisurely at a refreshing beverage, “is near Koehn post office, twenty-seven miles north of Mojave, on the old Searles borax road to Death Valley.” “Is it in the desert?” was asked. “Desert nothing! I’m tired of hearing that country called a desert. It’s just like the San Joaquin, and the climate is a darn sight better. “Where we struck the flow, the land is covered with little knolls on a country gradually rising toward the mountains. All about those mounds there was a little surface seepage, and I thought that by digging reservoirs at intervals along the slope the water might be caught so that it could be pumped when needed from the different reservoirs. The first hole, however, was the last. The idea was to cut them six feet square and twenty feet deep. Well, when the men got down about eighteen or nineteen feet, the bottom burst right up, and the water poured in so fast that they had to get out in a hurry. In less than forty minutes the reservoir was overflowing. “There is plenty of water for 100 stamps if necessary. The flow is six inches. The well is on C. A. Koehn’s homestead, but I have the privilege of using the water, and it is the only flowing water in the whole region. November 22, 1896: “KANE SPRINGS Twenty-six miles from Mojave and twenty-five from Randsburg a new and desirable vista presents itself to the east or west-bound traveler—a veritable “oasis in the desert,” and which will ere long doubtless become a popular resort for tourists, invalids and residents of the surrounding mining districts, covering an area of several hundred square miles. When the traveler alights from the stage, the first thing likely to attract his attention is the substantial stone building occupied by C. A. Koehn (owner and founder of Kane Springs), as a general store, meat market and restaurant. Close by a five-stamp mill, built to operate ten stamps and soon to be enlarged to its full capacity, owing to the rapidly increasing output of the mines in the surrounding district. Flocks of geese, also a large number of chickens, turkeys and hogs, all fat and contented, meander around the corral and farther away herds of well fed cattle, sheep and horses are browsing upon the native grasses. The question naturally arises. Where does the water come from to cause this gratifying change in the landscape and to supply the mill with water? A little investigation while the stage horses were being watered led the writer to the Kane springs, a never failing supply of pure mountain water which overflows the adjacent land, except when pumped to supply the stamp mill. The present flow of the springs is 100 miner’s inches, but it can be increased greatly by excavating to a depth of twenty or twenty-five feet and enlarging the area to fifty feet. Mr. Koehn is a good’ type of the shrewd German-American citizen, who, by thrift and energy, amassed considerable property in a few years, where the majority or people fail to do so. Attracted by the springs, he took up a homestead there of 160 acres in 1892, with the intention of starting a goat ranch; built a house, barn, etc. ; purchased two horses and a few fowls, which exhausted his saved up capital of $700. For some time afterward he made a specialty of supplying prospectors with groceries and provisions, and when Goler and Red Rock mining districts were booming, (in 1891), he opened a general store there. Last July lie removed his store to Randsburg, where he built the first substantial frame building erected in the present business district, which is still occupied as a general store and’ meat market. Mr. Koehn owns a valuable gold mine two miles south of Randsburg, which is described in detail in the list of mines of that district. The Immense deposits of salt (92 percent pure) on Dry lake, adjoining Kane springs, which are ten miles in length and from four to five miles in width, with a sulphur spring in the vicinity, will be utilized for baths, which, with the pure, dry air and abundance of sparkling mountain water, will make Kane springs an Ideal resort for invalids, especially consumptives. Mr. Koehn will erect suitable buildings for the accommodation of invalids as soon as the demand will justify it. March 2, 1897: “C. T. PEPPER & E. L. ALLEN OF THE WEDGE MINE (Randsburg), who have been here from Los Angeles for the past week, will leave for home tomorrow. The Wedge had recently been incorporated under the mining laws of Colorado, under the name of “The Wedge Gold Mining, Milling, and Water Supply Company, with a capital stock of $500,000, divided into shares of the value of $1 each. Charlie's Combination House, Store and Bar Was a Substantial Building For the Time. Roberta Starry Collection of the Maturango Museum. 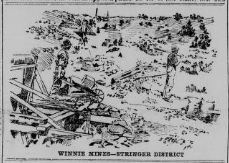 The Winnie Mine Was Charlie Koehn's Biggest Producer As A Mine. 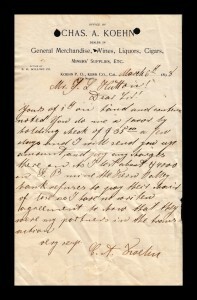 November 4, 1899: “NOTICE FOR PUBLICATION –Land office at Independence, Cal. Notice is hereby given that the following named settler has filed notice of his intention to make final proof in support of his claim, and that said proof will be made before A. C. Maude, U. S. Commissioner at Bakersfield, Cal., on December 4th, 1899, viz Charles A. Koehn, Homestead Entry No. 780 for the S. W. 1/4 , sec. 8, T. 30 S,. R. 38 E., M. D. M. He names the following witnesses to prove his continuous residence upon and cultivation of , said land, viz: William C. Wilson, of Mojave, Kern Co., Call; John H. Underhill, of Mojave, Kern Co., Cal; H. A. Blodgett, of Bakersfield, Kern Co., Cal. ; Charles A. Lee of Bakersfield, Kern, Co., Cal. November 14, 1903: “JUSTICE IS SUMMONED—JUDGE MANNING MUST EXPLAIN PROCEEDINGS IN RANDSBURG COURT –Charles Koehn Brings Habeas Corpus Proceedings to Get Out of Jail.—Charles Koehn who was brought to the county jail to serve a sentence of 180 days for battery, of which he was convicted in Justice Manning Court at Randsburg, was before Judge Bennett late yesterday afternoon on a habeas corpus application. His counsel, S. C. Smith, contended that there was a fatal flaw in the proceedings in the justice court but the court desired to get further evidence and ordered the case continued until Tuesday. Meanwhile a subpoena was ordered to be issued for Justice Manning to appear in court and testify in regard to the proceedings at the trial. Koehn still contends that the justice sentenced him to 200 days instead of 180, which is the limit and the justice is said to deny having done so. Koehn intimates that he can prove his contention by witnesses. He admits that the court record does not sustain his contention. November 13, 1903: “MUST SERVE SENTENCE AFTER LONG CONTEST—After Appeal Pending Over a Year Charles Koehn is Sent to Jail—Charles A. Koehn, who about a year ago, was convicted of battery in Justice Manning’s court at Randsburg, was brought to the county jail last night by Deputy Constable J. R. Price to serve a sentence of 180 days imposed at that time. The case has been pending since the conviction on account of an appeal which was taken to the Superior Court and recently dismissed by Judge Mahon. Koehn had trouble with a party in Randsburg about a year and a half ago and was arrested, at first on a felony charge. This was dismissed and one of battery substituted. He was tried and convicted before Judge Manning. E. M. Dearborn of Mojave appearing as his attorney and Deputy District Attorney Burton representing the people. November 18, 1903: COMMITMENT AND DOCKET BOTH DEFECTIVE –Judge Bennett After Thorough Investigation Discharged Chas. Koehn –Charles Koehn who was sentenced to 180 days in jail for battery, was discharged by Judge Bennett yesterday afternoon on a habeas corpus proceeding. The ground for the action was that the commitment failed to state any offense known to the law for which the defendant had been sentenced. October 11, 1907: “WAIVES EXAMINATION—S. F. Dixon is Bound Over at Randsburg on a Charge of Embezzlement –S. F. Dixon accused by Charles Koehn of embezzlement, waived right of preliminary examination, when his case was called before Justice Maginnis, of Randsburg, yesterday, and was bound over for trial before the Superior Court, bonds remaining at $500. Dixon has as yet secured no lawyer, but will retain one for the trial. He is confident of acquittal. November 27, 1909: “GYPSITE FOUND AT KANE SPRINGS –Charles Koehn Makes Discovery Of A Valuable Mineral—Is offered Fifteen Thousand Dollars for the Location, But Pioneer of Desert Refuses.—The new discovery of gypsite near Kane Springs is likely to result in some surprises. Although this ground has been passed over for years and not regarded as important, some time ago Charlie Koehn, who always has his weather eye open for good things, took it into his head that the stuff might be valuable, so he induced some parties to examine it after locating the ground. Parties came, and after examining, took an option on it for thirty days without naming a price, a small payment being made down. They made an examination and were so well pleased that they shipped ten tons of the stuff to Palmdale for a test. The test was so favorable that a few days ago they made Charlie and offer of $15,000 in payments. This he refused, as there is estimated to be 180,000 tons of it on forty acres and more nearby. JANUARY 23, 1912: “BAKERSFIELD, Jan. 23.—Single handed, Charles Koehn, proprietor of Kain Springs in the Mojave desert, about 20 miles west of Randsburg, engaged two Texas and Nevada gunmen and 15 companions in a battle Sunday and held them at bay for three hours, until the arrival of Constable Thompson and posse from Randsburg and Constable Hamilton, and three deputies from, Mojave. Were it not for an ingeniously contrived rolling fort behind which Koehn advanced and fired a few shots to frighten his assailants off his body might be reposing in a desert grave, for the gunmen shot to kill and, although their aim was bad, several dozen bullet holes were found in Koehn’s bulwark. Seven rifles and five revolvers were taken by the posse from Koehn’s enemies. To defend himself Koehn drove a bolt in each end of a pine log 18 inches, in diameter and four feet long, fastened a couple of shafts: to the bolts so that he could shove the log ahead of him like a lawn roller, built a superstructure of railroad ties, and, armed with a big army rifle, crept on hands arid knees, firing.as he, went, several miles over. The desert until he came up to the enemy. Koehn and taken to Randsburg, “where charges of disturbing the peace were lodged against them. They all gave bail, and Justice McGinnls: set their trials for February 5. February 9, 1912: “CHARLES KOEHN IS DECLARED NOT GUILTY—Charles A. Koehn, the Kane Springs salt claims prospector, was declared not guilty of the charge of disturbing the peace preferred against him as a result of his successful defense against the men who invaded his claim to post location notices. L.L. Rosenberger and Zed White who led the attack of Koehn’s claim, also were discharged, the former after a trial before the justice and the latter without a trial. Assistant District Attorney Tom Scott represented the state in the trials, which covered several days. February 9, 1912: “RANDSBURG JURY AQUITS KOEHN—Desert Pioneer Defends Self at Trial of Rolling Fortress Case—Defending himself in an all-day legal battle, Charles A. Koehn, the Kane Springs salt claims prospector was acquitted by a jury in Justice E. B. Maginnis court’s at Randsburg. Koehn was tried for disturbing the peace growing out of his “rolling fortress” assault on L. L. Rosenberger, Zed White and ten or fifteen other men who had invaded Koehn’s claim to post location notices. Rosenberger was tried without a jury and found not guilty of disturbing the peace by Justice Maginnis. White was discharged without a trial. Assistant District Attorney Tom Scott returned yesterday from Randsburg where he had been for several days trying the case. According to Scott’s statement Koehn, as he has done on previous occasions, put up a good defense and was able to convince the jury of his innocence, a verdict of acquittal being speedily returned. Koehn, behind a big log which he pushed 7000 feet across the boggy sands of the lake, drove off all of Rosenberger’s supporters and captured Rosenberger and White while, it is stated, they were pouring hot lead into his wooden fortress. Koehn could have shot down his assailants like rats but distained to do other than fire over their heads, poking his rifle through a porthole between the log and a heavy timber on top of it. some location notices. Nothing daunted Koehn speedily built his wooden fort and loading it on his two horse wagon, and he in spite of his wife’s expostulations started for the desert vats. He drove as far as his horses could go through the bog and then dropping the fort to the ground got behind it and slowly advanced on Rosenberger’s army. The San Francisco Call reported on January 24, 1912 that Charles Koehn Single handed engaged two Texas and Nevada gunmen and 15 companions in a battle Sunday and held them at bay for three hours, until the arrival of Constable Thompson and his posse from Randsburg and Constable Hamilton, and three deputies from Mojave. Were it not for an ingeniously contrived rolling fort behind which Koehn advanced and fired a few shots to frighten his assailants off his body might be reposing in a desert grave, for the gunmen shot to kill and, although their aim was bad, several dozen bullet holes were found in Koehn’s bulwark. Seven rifles arid five revolvers were taken by the posse from Koehn’s enemies. To defend himself Koehn drove a bolt in each end of a pine log 18 inches in diameter and four feet long, fastened a couple of shafts to the bolts so that he could shove the log ahead of him like a lawn roller, built a superstructure of railroad ties, and, armed with a big army rifle, crept on hands arid knees, firing as he went several miles over the desert until he came up to the enemy. Rosenberger of Los Angeles and “Slim” White were arrested with Koehn and taken to Randsburg, where charges of disturbing the peace were lodged against them. They all gave bail, and Justice McGinnls set their trials for February. The pitched battle is the last chapter in the trouble between Koehn and Rosenberger over Koehn’s salt claims in the dry salt: lake, where a fight between the same parties occurred a year ago. Charges of assault with intent to commit, murder were preferred against Koehn, but he defended himself in court and was acquitted. One of the interesting stories about Charley involved mining Charlie had many mining interest both in gold and other minerals such as salt and gypsite. Charley had an early interest in the Windy Mine, had the claim on the salt beds at Saltdale which he sold to the Diamond Salt Co. Had the early claims on the gypsite mined at Koehn (Kane) dry lake and a mine in the Stringer District called the Winnie that he had purchased from the original discoverer, Ed Hammond. Charley leased this mine out to an old prospector by the name of Witte. Witte sunk the shaft down twelve feet and took out six sacks or ore that would net him about $800. Witte than proceeded to Kramer, and exhibited the ore, telling a story that he had found a new strike, but only giving a general hint as to its location. Some railroad men advanced him some money for development work. 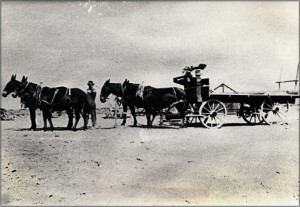 Needing a wagon and horses, Witte proceeded to Bakersfield to purchase them. While in Bakersfield, Witte took to celebrating a bit too much and ended dying with his boots on as a result of a gunshot wound received during a drunken quarrel. Thus having died with the secret of his “new discovery” another lost mine legend began. The men in Randsburg got the story of this lost mine from the boys in Kramer, via the fellows in Mojave. Somewhere along the line they forgot to mention the name of the miner. Charley having heard this story twice scoured the country looking for the lost mine. The name of the old miner finally reached the ears of Pat Bryne at the Mountain View Saloon. Now Pat knew that Witte had taken some ore out of the Winnie, but had not known that he was the prospector that had died in Bakersfield. When talking with Charley about the story they finally put two and two together and found out Charley had been spending money looking for a mine that he already owned, and in fact was already played out. 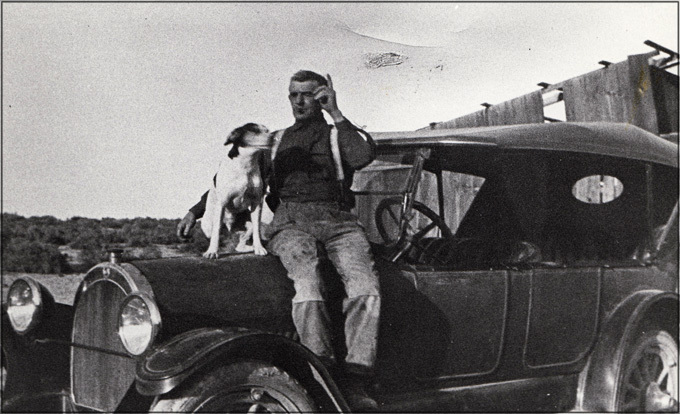 Charlie Koehn With a Later Model Automobile. 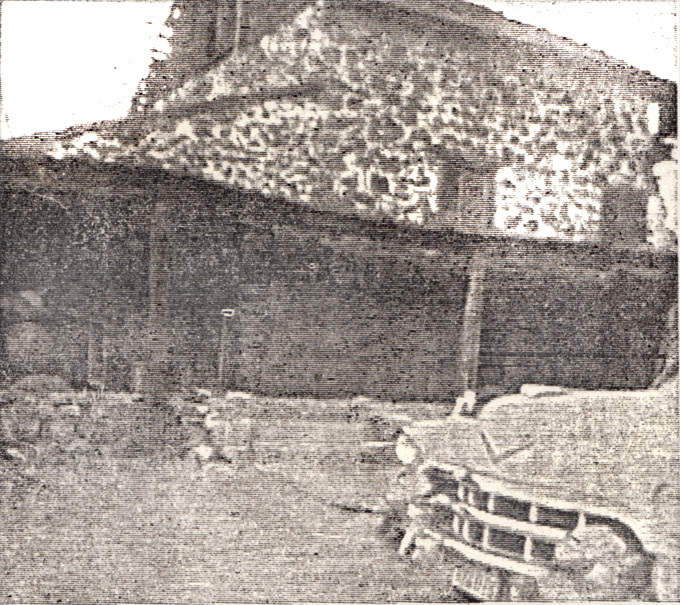 The automobile was instrumental in bringing civilization to the remote desert areas like Koehn Springs. March 6, 1919: “FILES SUIT TO QUIET PLACER CLAIM TITLES — Asking that the gypsum placer claims in section 8, 30-27 on the Mojave desert be quieted, Charles A. Koehn today filed suit against Charles F. Stern et al. The claims were formerly owned by the California Gypsum and Plaster Company; it was stated in the complaint. July 15, 1924; ‘COYOTES MUNCH MELLONS –Randsburg, July 15. – A visit to Koehn’s station on the road to Cantil found the original locator, Charles Koehn, still improving his many hundreds of acres of lake holdings. His last successful development is the finding of a gravel bedrock at 150 feet for the new artesian flow brought in on his pumpkin patch. February 17, 1928: “$50,000 SUIT OVER CONTRACT CONTINUED—Because of the absence of a witness from this state the $50,000 suit, of the Alpine Cement and Plaster Company against Charles A. Koehn et al has been continued indefinitely. Judge C. E. Beaumont of Fresno, sitting in Superior Court, Department Three, where the hearing was in progress, has returned to his home in the northern valley to await return of the witness to Bakersfield so that the case may continue. May 17, 1928: “ATTEMPT MADE TO BOMB FRESNO HOME; MAN HELD—Fresno, May 17.—A home-made infernal machine with the fuse extinguished less than a foot from the explosive was found by Superior Judge Campbell E. Beaumont on his front porch early today when he opened the door to get his morning newspaper. The machine was so designed as to spread flame in the wake of its explosion. Charles A. Koehn, giving the address of Saltdale, on the fringe of the desert, known as a “desert rat,” was being held for investigation by police on suspicion of having planted the death dealing contraption. The bomb consisted of two parts, one containing the explosive and the other a quantity of gasoline. The bomb, which was directly in front of the door of the judge’s home at 3957 Kerckhoff Avenue had been placed there about 1 o’clock this morning according to the police. The fuse had apparently extinguished itself, thus preventing the setting off of the explosive, believed to be nitro glycerin. Upon finding the bomb Judge Beaumont removed it to his garage and then notified the police and sheriff’s office. Koehn was almost immediately linked with the bombing attempt because he had been arrested at 1:30 a. m. by two patrolmen who saw running from an alley near the Beaumont home. Following his arrest as a suspicious character his automobile, parked nearby was searched and a section of fuse matching that attached to the infernal machine was found. Later a further search of the car revealed portions of Los Angeles newspaper, other parts of which had been wrapped about the bomb. MAN RECOGNIZED—When Koehn was taken before him, Judge Beaumont immediately recognized him as a defendant in a $50,000 damage suit in which the jurist sat in Kern County a few weeks ago. The case, however, has not yet been decided. The suit involves a gypsum deposit in the desert near Koehn’s home. May 17, 1928: “FRESNO JUDGE WHO SAT IN LOCAL CASES DEATH TARGET—Charles Koehn, Saltdale Resident, Is Jailed by Officers –EVIDENCE FOUND IN ROOM, ALLEGED—Fuse of Crude Device Partly Burned When Discovered, Report—Charles Koehn, Kern County “desert rat” by his own description, a resident of Saltdale on the Mojave Desert, is being held in the Fresno jail in connection with an alleged attempt to bomb the home of Superior Judge Campbell E. Beaumont early today, according to a special dispatch to The Californian. The bomb, consisting of two parts, one containing the explosive and the other gasoline, was found by the jurist when he opened his front door to get a newspaper. The fuse had extinguished itself when less than a foot remained. EVIDENCE FOUND—Koehn was arrested by the police as a suspicious character prior to discovery of the bomb—as he ran from an alley two blocks away from the Beaumont home. In his automobile was found a quantity of fuse which matched that attached to the bomb. While Koehn denies implication and said he was lost, the officers found torn portions of a Los Angeles newspaper in his car which matched a piece wrapped around the top of the infernal machine. Both the explosive and the gasoline were contained in discarded coffee cans, blackened and rusted with age. CASE HEARD HERE—When Koehn was led before him, Judge Beaumont recognized his as a defendant in a $50,000 damage suit in which the jurist sat in Kern County a few weeks ago. Judge Beaumont, early this spring heard a number of civil cases in Kern Superior Court, sitting for the judge Howard A. Peairs, and among the cases, court records reveal was that of the Alpine Cement Company vs. Charles Koehn, involving a gypsite plant on the Mojave Desert. The suit began February 15 here and _inter was taken under advisement, no decision having been rendered by Judge Beaumont to date. Charles A. Koehn, giving his address as Saltdale, on the fringe of the desert, known as a “desert rat” was being held for investigation by police on suspicion of having planted the death dealing contraption. MAY 19, 1928: “DESERT FRIENDS OF KOEHN WILL COME TO HIS AID WITH BAIL CASH.—Move Launched Here to Free Prisoner in Fresno for Period Until Trial—ATTORNEY IRWIN IN COURT FOR DEFENSE—Resident Held for Alleged Bomb Attempt Sponsored Cantil Event May 30—Desert friends of Charles A. Koehn, Saltdale miner who is accused of attempting to bomb the home of Superior Judge C. E. Beaumont in Fresno Tuesday morning, are attempting to raise the $25,000 bail fixed for Koehn when he was arraigned in police court late Friday, it was learned here today. WILL MISS PROGRAM—“We have got to get Charley out pretty soon or he’s going to miss the big doings over at Cantil when we fix up the burying ground May 30.” A desert friend of Koehn’s said today while in Bakersfield. The “doings” of which the desert resident spoke were announced several days ago by J. S. Bishop, Cantil resident, who with Koehn was sponsoring a gathering of Kern residents at Cantil May 30 to fix up the graves in the cemetery, in which many Kern pioneer miners and borax team drivers are buried. 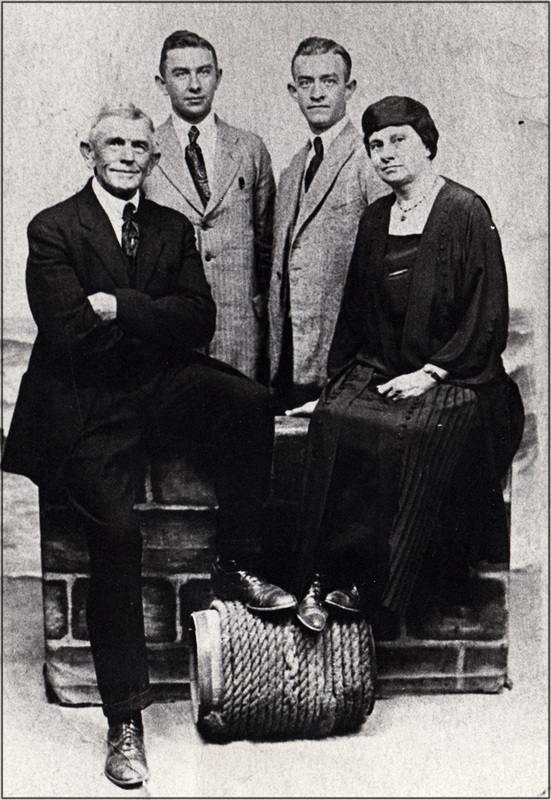 Charles A. Koehn His Wife Jenny and Two Of Her Nephews. --Roberta Starry Collection of the Maturango Museum. District Attorney Glenn M. Devore of Fresno County appeared against Koehn in Police Court Friday. He suggested to the court that bail be set at $15,000 on each of the two counts against Koehn, but Attorney Irwin protested, declaring that his client would not leave the country even though he were released on his own recognizance. June 30, 1928: “CHARLES KOEHN OUT ON DESERT FAILS TO PLEA—Scheduled yesterday to enter pleas of guilty or not guilty to charges of attempted murder and malicious use of explosives, Charles A Koehn, Mojave Desert miner, failed to appear when court was called in Fresno. Koehn, arrested in connection with the attempted bombing of Superior Judge C. E. Beaumont’s residence in Fresno, May 17, was released early this week on $40,000 bond. He left Fresno immediately following his release for Kern County, and the desert, with no means of communication in its out-of-the-way corners, apparently has swallowed him. Superior Judge Denver S. Church was scheduled to hear the Kern man’s pleas Friday, but Koehn failed to appear and his arraignment was continued until July 6. August 22, 1928: “NEVER INTENDED BOMB EXPLOSION, KOEHN DEFENSE—Bakersfield Doctor Declares “Desert Rat” Paranoia Victim—Charlie A. Koehn. Kern desert prospector and mining man, merely wanted to frighten Judge C. B. Beaumont and never intended that the bomb he placed on the porch of the Beaumont residence in Fresno should explode, he told a jury in Fresno Superior Court Tuesday when he took the witness stand in his own defense. Koehn, charged with attempted murder and malicious use of explosives, is being tried on his plea of “not guilty by reason of insanity.” He sprung his own surprise on the court when placed on the stand yesterday. DEFENSE CALL EXPERT—Dr. Sabich was called by defense counsel, Attorney Rowen Irwin of Bakersfield and Attorneys Lindsay and Georhart of Fresno. Insistent reiteration by Koehn that he “was being robbed by the courts” and that he “thought he had a right to scare Beaumont,” only aided the defense in building up its insanity case. Koehn was involved last spring in a civil case being tried in Kern Superior Court by Judge Beaumont. KOEHN SPRINGS SURPRISE—Koehn sprung his surprise on everyone but his lawyers by saying that the fuse on the bomb was burned at his Saltdale ranch days before he went to Fresno. The fuse never was lighted on the Beaumont porch, he says. It was an old “Sure Shot” fuse, famous with miners. Koehn told how he had rubbed black grease under the coffee can in which were the explosive to make it look as through the fuse was burned on the Beaumont porch. Others called to testify during the day included J. W. McGraff, J. L. Osborn, and T. F. Allen, all of Bakersfield. August 23, 1928: “JURY MAY GET KOEHN BOMB EVIDENCE TODAY –A Fresno county jury may decide tonight whether Charles Koehn, eccentric desert character of Kern County, is sane of insane. Koehn is on trial in Fresno Superior Court on charges of attempted murder and malicious use of explosives, to both of which he entered pleas of not guilty by reason of insanity. By the plea he admitted placing a bomb on the front porch of the Judge C. E. Beaumont residence. The bomb failed to explode, saving the Beaumont family and a good sized section of Fresno’s residential section from destruction, the prosecution alleges. Arguments by defense counsel, Attorneys Rowen Irwin of Bakersfield and Gearhart of Fresno were scheduled to begin today and it was considered likely that the case would go to a jury before court adjourns this evening. Three witnesses, Dr. George Sabichi of Bakersfield, Dr. C. P. H. Kjaerbys of Fresno, and Dr. J. L. Richards of San Francisco, have testified that Koehn is a paranois, explaining that a paranoiac is one with an exalted opinion of one’s self and one’s abilities, combined with a delusion of oppression by others. As a paranoiac, Koehn is not responsible for his actions, the doctor testified. August 24, 1928: JURY DELIBERATING ON FATE OF KOEHN—A jury of 12 men today is deliberating upon the sanity of Charles A. Koehn, Kern Desert miner, on a trial in Fresno Superior Court on an alleged attempt to bomb the residence of Superior Judge C. E. Beaumont. Koehn is being tried on his pleas of not guilty by reason of insanity. The case was given to the jury late Thursday and at a late hour this morning no verdict had been reached. August 24, 1928: “JURY DISAGREES IN KOEHN BOMB HEARING—After failing to reach an agreement in hours of deliberation, the jury trying Charles A. Koehn, Kern mining man, in Fresno Superior Court for the attempted bombing of Judge C. E. Beaumont’s home, was discharged late today, according to a special dispatch to The Californian. August 25, 1928: “JURY IN KOEHN BOMBING TRIAL JUDGE’S TARGET—Jurist Insinuates Possibility of Paranoia Among Jurors—Mildly insinuating that there might be paranoiacs on a jury which could not agree after hours of deliberation, Judge Charles R. Bernard, Friday dismissed the jurors who sat in the trial of Charles A. Koehn, eccentric Kern desert character, charged with the attempted bombing of Judge C. E. Beaumont’s residence in Fresno. Koehn pleaded not guilty by reason of insanity, and defense counsel offered medical testimony that Koehn is a victim of paranoia. In the meantime, Koehn was sent back to Fresno County Jail to await a new trial, with his bail increased from $30,000 to $100,000 cash bond or $200,000 property bond. September 20, 1928: “KOEHN RELEASES ATTORNEYS; WILL FIGHT OWN CASE—Desert Man Declares He Will Change Plea; Is Opposed By Devore—Charles A. Koehn, self-styled “desert rat” of Kern County will turn attorney in his own defense when he goes on trial Monday in Fresno Superior Court for the second time on charges of attempted murder and malicious use of explosives. His first trial ended in a deadlocked jury. The charges grew out of the finding of a bomb on the front porch of the Judge C. E. Beaumont residence in Fresno. He is going to change his plea back to not guilty and withdraw the plea of not guilty by reason of insanity, he says. DEVORE SAYS NOT—District Attorney Glenn Devore says Koehn isn’t going to do any such thing if he (Devore) can help it. “They (his attorneys) soaked me $5000 for the first trial, got me a hung jury and then said they wanted $4000 for the second trial.” Koehn wrathfully told reporters at the Jail. September 22, 1928: “KOEHN SUCCEEDS IN PLEA CHANGE—Substitutes Plea of “Not Guilty” for Insanity Defense at Fresno—Charles A. Koehn, Kern County prospector who “fired” his attorneys and will defend himself in Fresno Superior Court on charges of attempting to murder Judge C. E. Beaumont, entered the legal ring to win his first bout with Dist. Atty. Glen Devore Friday, according to dispatches here today. Koehn lost only “the last round of the entire bout,” having “a shade in all the other rounds.” In the “last round” he tried to have the charge of malicious use of explosive dropped, but failed. The two charges, attempted murder and malicious use of explosives, grew out of an alleged attempt to bomb Judge Beaumont’s residence. September 24, 1928: “KOEHN DEFENDING SELF AT FRESNO—Asks Judge From Some Other County, but Motion Denied by Court—Fresno, Sept. 24—After his motions for continuance and a change of judge on the ground of prejudice had been denied, Charles A. Koehn, 67-year-old “desert rat,” went out on trial here today for the second time on charges of attempting to murder Superior Judge C. E. Beaumont and the malicious use of explosives. The jury disagreed in a trial on the sanity of Koehn last month, but in the present trial he is fighting the accusation on a plea of not guilty. “All the judges in Fresno County are associated with Judge Beaumont, the complaining witness in the case, and I believe I should have a judge from some other county,” the aged prospector told Superior Judge Charles H. Barnard, who is hearing the case. After discharging two sets of attorneys, Koehn acted as his own counsel today, interrogating prospective jurors. He told the court that he wished to secure another attorney to represent him later in the day, however. T. F. Allen, Bakersfield attorney, who was seated in the courtroom, announced that he had been retained by Koehn. Koehn was arrested on May 16 last, when Judge Beaumont found a nitroglycerin bomb on the porch of his Fresno home. The fuse burned out and the bomb did not explode. The state contends that Koehn sought to kill Judge Beaumont to prevent the jurist from making a decision in a damage suit for $50,000 in which the “desert rat” was the defendant. The case was heard before Judge Beaumont in Bakersfield last April. The jury, composed entirely of men, was selected in less than an hour. Koehn exercised one challenge, excusing the only woman on the panel. September 25, 1928: “KOEHN SPEEDING UP FRESNO TRIAL – Accepts Jury of Twelve Men in Rapid Order; Excuses Woman From Duty—Charles A. Koehn, Kern desert prospector, who is acting as his own attorney during his trial on charges attempting to murder Judge C. E. Beaumont of Fresno, is setting a speed record in Fresno Superior Court. The sun-parched, self-styled “desert rat” of Kern is amazing Fresno with his conduct in court and his knowledge of law, according to reports here. Monday, the opening day of his second trial, he accepted the first 12 men in the jury box, excusing only one woman, and the state began putting on its witnesses immediately. Then he gave the first for the defense a hard few minutes cross-examination and chalked up his first score on the case against him. This witness, A. B. McKinney of Kern County, had testified, he heard Koehn voice a threat to injure Judge Beaumont if the judge decided a suit against, Koehn. McKinney referred to a Kern County suit over which Beaumont presided and in which Koehn was involved. “When did I say that?” Koehn demanded of McKinney on cross-examination. “Are you sure I said I would, or I ought to?” Koehn asked. September 26, 1928: DESERT MINER CONVICTED OF BOMB ATTACK—Koehn Guilty on Two Counts by Jury; Recommends Leniency –Fresno, Sept. 26.—Charles A. Koehn of Kern county self-styled desert rat, was found guilty last night on two counts, one of attempting to murder Superior Judge C. E. Beaumont with a bomb and the other of malicious use of high explosives. The jury recommended leniency. He will be sentenced Friday morning by Superior Judge Charles R. Bernard. Koehn, who is 47, pleaded his own case at this, his second trial, the jury in the first trial disagreeing on his plea of not guilty by reasons of insanity. This plea he later withdrew. In his closing argument today, Koehn characterized Judge Beaumont as the “bandit in the court house” and a “sheep” and referred to a previous civil suit for $50,000 against himself over which Judge Beaumont presided at Bakersfield and which Koehn feared would be decided against him. Koehn, who admitted placing the coffee can bomb on Judge Beaumont’s porch here in Fresno, denied that he intended to kill the judge. September 26, 1928: “KOEHN CONVICTED ON TWO CHARGES AFTER PRESENTS OWN COURT CASE—Prospector in Plea to Jury Surprised Spectators by Knowledge of Law –DENIES ALLEGATION OF MURDER ATTEMPT—Will be sentenced Friday to Term in San Quentin; Assails Beaumont—After acting as his own attorney and conducting one of the speediest trials in Fresno court history, Charles A. Koehn, Kern County’s eccentric “man of the desert,” last night was found guilty on both counts, of attempted murder and malicious use of explosives, in connection with an alleged attempt to bomb the Fresno residence of Judge C. E. Beaumont. The jury deliberated only a few hours and returned its verdict with a recommendation for leniency. Sentence is to be passed by Judge Charles R. Barnard at 9:40 o’clock Friday morning. The trial lasted just two days. The self-styled “desert rat” of Kern County amazed courtroom attaches by his adeptness as an attorney in defending himself. ASSAILS JUDGE—He received the verdict with but little show of emotion and stated before the court that the district attorney’s office had treated him fairly and permitted him to get all of his evidence before the jury. Koehn was the defendant in a $50,000 damages suit involving his Mojave Desert properties, heard recently in Kern Superior court by Judge Beaumont. No decision has been rendered in this case. “NO MURDERER,” SAYS—The 67-year-old prospector scoffed at the idea that “he was a mean old man with murder in his heart,” as he was described by the prosecution. “If I was a murderer,” Koehn told the jury, as he pounded a copy of the penal code against his fist, “I could have killed Beaumont in the streets of Bakersfield. September 27, 1928: “DECLARE DESERT MAN GIVEN FAIR HEARING—Charles Koehn, desert man convicted in the Fresno Superior Court in connection with placing a bomb on Judge C. E. Beaumont’s porch, had the fairest kind of trial, Detective A. E. Cook said here today on returning from Fresno. September 28, 1928: “KOEHN IS GIVEN STAY FROM TERM—Sentenced to Prison, Local Desert Man Appeals for Court Alternatives—Fresno, Sept. 23—Charles Koehn, 67-year-old prospector from the Mojave Desert, was sentenced in the Superior Court today to an indeterminable term in San Quentin prison on his conviction of attempted murder of Superior Judge C. E. Beaumont and malicious use of explosives. The law provides sentence of from 1 year to 20 years on the first charge and from one year to life on the second. Koehn, who admitted that he placed what he called a “dud bomb” on the front porch of the jurists home to frighten him, made motions through his counsel for arrest of judgment, resetting of the trial on his original motion of not guilty by reason of insanity, a new trial, and that probation be granted. These were denied but a stay of execution for 10 days was granted. In denying Koehn’s motions, Judge Charles R. Barnard said the law made it impossible for him to follow the jury’s recommendation for leniency. September 29, 1928: “SENTENCE KOEHN TO SERVE LONG TERM IN PRISON—“Desert Rat” Must Spend One to Fifteen Years in San Quentin, Edict—Many months will elapse before Charles A. Koehn, aged Kern Prospector, again prods a burdened burro over the sands of the of the Mojave desert in search of precious metals. Koehn today was under sentence of from 1 to 15 years in San Quentin for the attempted murder of Judge C. E. Beaumont of Fresno, and one year in San Quentin for the malicious use of explosives, the sentences to run consecutively and nor concurrently. A jury in Fresno Superior Court this week decided that Koehn placed a dynamite bomb on the front porch of the Beaumont residence with intent to murder Judge Beaumont. The bomb did not explode. After being found guilty, Koehn filed motions for a new trial, release on probation, a stay of execution, and various other resources. The stay of execution was granted by Superior Judge Barnard and Koehn has 10 days to get his affairs in shape before he passed through the gates of San Quentin penitentiary. September 29, 1928: “PROSPECTOR GIVEN SAN QUENTIN TERM—Fresno, Sept. 29.—Convicted of attempted murder and the malicious use of explosives, Charles A. Koehn, aged desert prospector, was today under sentence of from 1 to 15 years in San Quentin on the first count and one year on the second. Judge Barnard ordered that the terms should run consecutively and not concurrently. Various motions by defense attorneys, including those for a new trial and release on probation were denied, but Koehn was granted ten days in which to arrange his affairs before being taken to prison. December 3, 1928: “DESERT RAN” MAKES HIGH COURT APPEAL—San Francisco, Dec. 3.—The appeal of Charles A. Koehn, desert prospector, under sentence to San Quentin for an alleged attempt to dynamite the home of Judge C. E. Beaumont in Fresno was submitted to the State District Court of Appeals today. The chief contention of the man’s attorneys was that their client should not have been convicted on two counts, attempted murder and malicious use of explosive. The State District Court of Appeals at San Francisco reversed his conviction on the charge. But there is small consolation for the Kern miner in the reversal as the court upheld his conviction on the more serious charge of attempting to murder the jurist. Koehn was convicted on both charges last year in the Fresno County Superior Court. He was arrested as a suspicious character while coming out on an alley back of the Beaumont residence and a short while later Judge Beaumont arose to find an unexploded bomb outside his front door. February 2, 1929: “BOMBER’S CONVICTION AFFIRMED BY COURT –San Francisco, Feb. 2.—The state district court of appeals has affirmed the conviction in the Fresno superior court of Charles A. Koehn of an attempt to murder Judge C. E. Beaumont in May 1928, by placing a bomb under his home. March 3, 1929: “KOEHN AWARDED REHEARING BY SUPREME COURT—Carrying his fight for freedom into the State Supreme Court, Charles A. Koehn, self-styled Kern “desert-rat,” scored victory in the high court Friday when he was granted a rehearing of his appeal of his conviction on charge of attempting to murder Superior Judge C. E. Beaumont of Fresno, according to a press dispatch here today. Koehn at present time is an inmate of San Quentin penitentiary serving an indefinite number of years for an attempted murder. The Appellate Court recently reversed a jury’s verdict finding Koehn guilty of malicious use of explosives but upheld the verdict finding him guilty of attempted murder. It was alleged during his trial that he placed a bomb, which failed to explode on the front porch of the Beaumont residence. July 30, 1929: “STATE REVERSES KOEHN DECISION –Conviction of Kern Man on Attempted Murder is Overruled—California’s Supreme Court has just issued a decision relative to the Charles A. Koehn case concerning the alleged bombing of the home of Judge C. E. Beaumont of Fresno following and adverse decision against Koehn while Judge Beaumont was sitting in the Kern County Superior Court. The Supreme Court has found Koehn guilty on only the charge of having used explosives and has overruled the conviction on the charge of assault with attempt to commit murder, according to information supplied Atty. Rowan Irwin, who defended Koehn. Koehn was a Kern County resident from the Mojave Desert. Koehn was convicted in Fresno during 1928 following the alleged bombing. In Fresno, Attorney Irwin made a motion to dismiss one of the two counts against the defendant on the grounds that the state was charging him with the same state of facts for two offenses. The court denied this motion and tried Koehn on both counts and he was convicted on both. The District Court of Appeal then set aside the judgment convicting Koehn on the use of explosives and sustained the judgment on the attempted murder count. From this decision both sides appealed in the Supreme Court. The Supreme Court reversed the District Court of Appeal decision by setting aside the judgment of conviction on attempt to commit murder and reversed the count for having dismissed the charge appertaining to the use of explosives. The Supreme Court then sustained the trial court in having convicted Koehn on the use of explosives. Thus Koehn finally stands convicted on the explosive charge.